A recent University of Nebraska–Lincoln study demonstrated that SHREDLAGE® corn silage, produced exclusively by the CLAAS JAGUAR forage harvester, improved average daily gains and feed-to-gain ratios when used as a roughage component in the finishing diets of beef cattle. In the study, cattle that were fed rations containing SHREDLAGE corn silage experienced a 2.9 percent greater average daily gain and a 4.4 percent greater feed-to-gain ratio when compared to the control groups fed conventionally chopped and processed silage. “The results of the study suggested that feeding 9 percentage roughage in the diet and using a process such as SHREDLAGE that increases particle size actually increased performance in the cattle efficiency as well as final product,” said Karla Jenkins, a University of Nebraska (UNL) cow/calf systems and stocker management researcher. By chopping corn silage at lengths ranging from 21 to 30 millimeters and then shredding the chopped material with a special SHREDLAGE processor, the JAGUAR produces a silage with improved bacterial fermentation during ensiling which results in greater digestion in the cow’s rumen. Past studies have proven significant benefits of using SHREDLAGE in dairy cows — including improved milk production — but until now, no trials had been conducted using beef cattle. University researcher Karla Jenkins wanted to determine how adding SHREDLAGE as a roughage component to a steam-flaked corn diet would affect finishing beef cattle. Since roughage tends to be bulkier and more expensive than other parts of a finishing diet, the research tested different amounts and processing methods to determine the most efficient means of incorporating the needed roughage component into the finishing diet without causing a negative impact on feedlot performance. “The hypothesis for this study was that if we could have a little larger particle size in the roughage, such as a silage-type roughage, that possibly we could reduce the amount fed, which would then reduce the amount in the truck and increase the efficiency of feeding and still maintain rumen function for the animal,” Jenkins said. The 128-day study was conducted during the finishing period for beef cattle at the University of Nebraska Panhandle Research Feedlot in Western Nebraska. In the study, final finishing diets contained 9 or 14 percent of either SHREDLAGE cut at 26.5 mm or conventionally chopped and processed corn silage cut at 13 mm. The diets also contained 15 percent wet distillers grains and 5 percent mineral supplement on a dry matter basis. The remainder of the diet dry matter came from steam-flaked corn. “All of the silage for the study came from the same irrigated field, harvested on the same day, and moisture and starch levels were the same. The SHREDLAGE was harvested by a JAGUAR 960 with an ORBIS 750 header, both corn silages rated in the excellent category with processing score average of 72.4 for conventional and 74.3 for the SHREDLAGE, so both were very close, meaning the difference in the outcome came from the processing of the stalk and length, ” said Matt Jaynes, product manager for CLAAS. The most impressive results of the study showed that the feed containing 9 percent SHREDLAGE corn silage had a 7.4 percent greater feed-to-gain ratio and 5.4 percent better average daily gain than feed containing 14 percent conventionally chopped and processed corn silage. 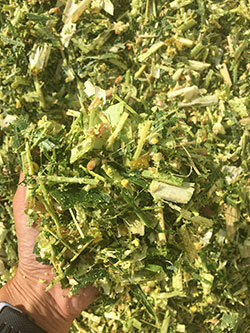 The intensive processing of SHREDLAGE has been previously proven in dairy cows. A 2012 trial conducted by the University of Wisconsin showed that SHREDLAGE dramatically increases the physical effectiveness of corn silage in the rumen while improving availability of the starch contained in all parts of the plant. The result of the Wisconsin study was an increase of 2.4 pounds per cow in daily milk yield. For more information about the University of Nebraska–Lincoln beef study, click here. For more information about the University of Wisconsin dairy study, click here. For more information about CLAAS, visit the company’s website at claas.com.